Tube Size (Sch40) 1/2" 3/4" 1" 2"
Fitting Size (PVC) 1/2" 3/4" 1" 2"
Tube O.D. 0.840" 1.05" 1.29" 2.4"
Tube I.D. 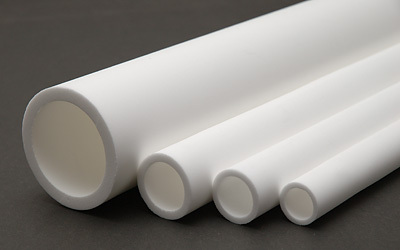 0.618" 0.810" 0.960" 1.87"
High Density Polyethylene (HDPE) Porous Tube is a durable solution for fine pore diffusion of air and other gases. Each tube is designed to fit standard Schedule 40 PVC end fittings and couplings. 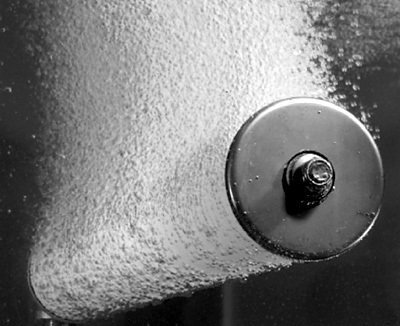 The omni-directional porous structure is excellent for diffusing, sparging, and aeration applications, emitting a multitude of small, evenly distributed bubbles. Air agitation of electroplating solutions baths. Fermentor sparging for food, beverage, and pharmaceutical industries. Rigid, lightweight Schedule 40 sized tubes are easy to handle and can be easily fabricated into piping systems with off the shelf components. High-density polyethylene tubes have excellent resistance to chemicals and abrasion. Omni-directional porous structure, available in fine, medium, and coarse pore sizes, provides uniform distribution of fine bubbles. Material complies with the Code of Federal Regulations, Title 21, Section 177.1 520 Item 2.1, for food contact. Conventional band, table, and hand saws may be utilized as well as lathes and drills. External or internal threads can be cut using standard metal cutting tools, either on a lathe or by hand. A stronger thread can be achieved by dipping the area to be threaded into PVC pipe cement and allowing it to harden before cutting the threads. Tubes can be bonded to fittings and couplings using hot melt adhesives, PVC plastic pipe cement, epoxy, or similar sealants. These adesives form a strong mechanical bond by curing on the surface and within the pore structure of the tube. Throughout all HDPE porous plastic runs an intricate network of opencelled, onmi-directional pores. 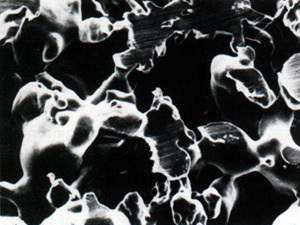 These pores, which can be made in average pore sizes down to one micron, give porous plastics their unique combination of filtering capability and structural strength. Unlike the direct passages in woven synthetic materials and metal screens, the pores in porous plastic join to form many tortuous paths giving porous plastics a dual filtering capability. Not only do they act as surface filters by trapping particles large than their average pore size, they also trap much smaller particulate matter deep in their complex channels for a "depth filter" effect. This tortuous path structure is so efficient that, as a rule of thumb, with an average pore size of 25 microns, offer you approximately the same filtration as many five micron-rated filters. HDPE can be used in continuous service at temperatures up to 180°F (82°C) and intermittently at 240°F (116°C). If not stressed, it is stable at 212°F (100°C) in continuous service. HDPE Porous Plastics are naturally hydrophobic, but aqueous solutions can be forced through under pressure. The material is cleanable with HCI (muriatic acid) or chlorine. Not recommended in presence of strong oxidizing acids, prolonged fire and sunlight and solvents above 176°F (80°C). © 2018 Alita Industries, Inc. All Rights Reserved.